K-pop sensation BTS is being commended for its contributions in spreading Korean culture and language, the presidential office said Monday. Cheong Wa Dae spokesman Kim Eui-kyeom said it had been decided at a Cabinet meeting held earlier in the day to award the seven members of the boy band with a fifth-class Hwagwan Order of Cultural Merit. 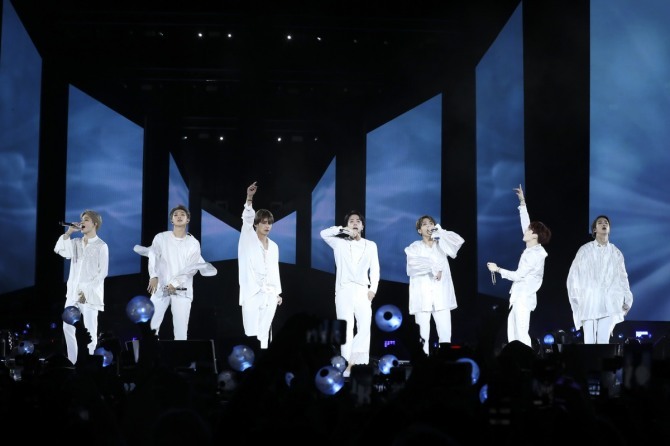 “Many young people overseas are now singing Korean lyrics, one of the examples of (BTS) contributing to not only spreading Hallyu, but also Hangeul,” Prime Minister Lee Nak-yeon was quoted by Kim as saying. Tuesday marks Korea’s annual Hangeul Day. Actor Lee Soon-jae will also receive the Hwagwan medal, while the Grand Order of Mugunghwa -- the top order of any kind in Korea -- will be bestowed upon French President Emmanuel Macron for his contribution to the relationship between the two countries. The Order of Cultural Merit is awarded by the president to those deemed to have given outstanding meritorious services in the culture and arts field serving the interest of promoting Korean culture. Actor Bae Yong-joon, who contributed to spreading the word for “Hallyu” to encompass Korean arts with his popularity in Japan, received the Hwagwan award in 2008. BTS is among the most popular, and perhaps singularly most successful, Korean musical acts internationally as of today. It remains the only K-pop artist to top the Billboard 200 albums chart -- having done so with “Love Yourself: Tear” and “Love Yourself: Answer” -- while no other Korean artist had even cracked the top 30.